There is a peculiarly intimate relationship between a pastel and its frame , arising from the fragility of the medium and the need to encase it in its protective environment – a sealed unit including glass, frame, pastel and backing – from the earliest stage: normally before it left the artist’s studio . Several things follow from this. Firstly, the pastellist will normally chose the framer, and typically will work with the same framer at least for a period: so that identifying particular models can be an aid both to attribution and to chronology. Secondly, even in the rare cases where artists’ original invoices survive, the framer is unlikely to be identified. So the precious documents studied by furniture specialists identifying some of the glories of French craftsmanship executed for the Bâtiments du roi and intended to grace official portraits for diplomatic gifts etc. are rarely relevant to pastellists . 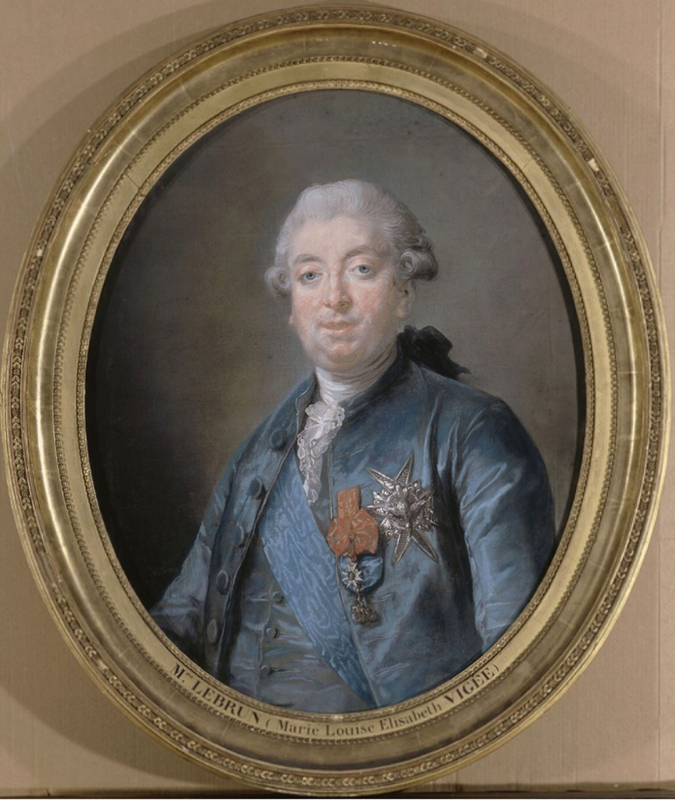 And if among the exceptions we can list a couple of tours-de-force for La Tour pastels (the outstanding frames for the portraits of the royal family by Louis Maurisan come to mind), we have to acknowledge a further difficulty in tracing the work of Paris framemakers, namely the profusion of trades which were involved. While many of these were protected – even painting had its guild, as Vigée Le Brun herself found to her cost – frames could be supplied by an ébéniste, a menuisier, a sculpteur or a doreur, each trade involved in the extremely complicated processes involved in creating these sophisticated objects. Thus an order for a frame could involve extensive subcontracting, compounding the difficulty of finding a paper trail to connect a picture with the maker(s) of its frame. 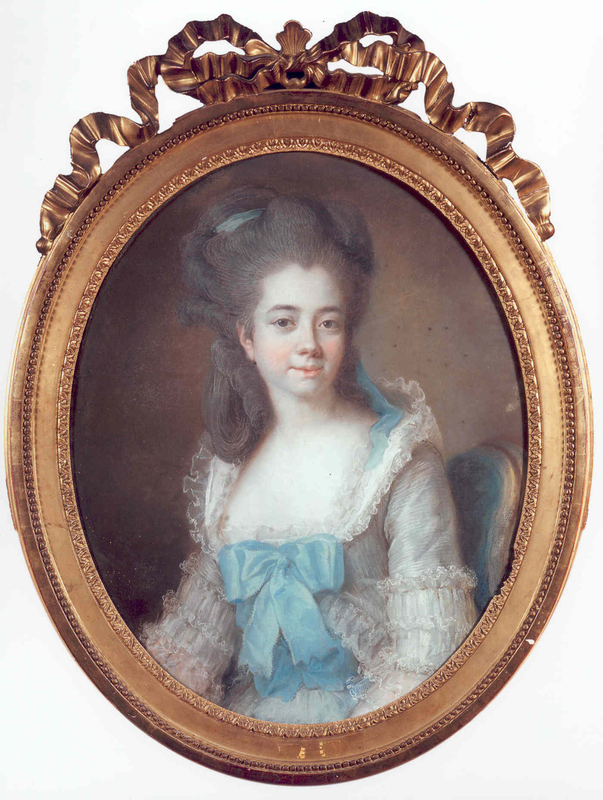 This of course was a world with which Vigée Le Brun was familiar from infancy: one of the witnesses at her parents’ wedding in 1750, a cousin of her mother, was a member of the Pecquerie family of peintres-doreurs, one of whom was later recorded working for the Penthièvre branch of the royal family in 1780. But the absence of those documents is compounded by another feature which applies to Vigée Le Brun and to a handful of other dix-huitième pastellists: in the revival of interest in the medium c.1900, a great many pastels by the ‘big names’ were reframed by dealers for marketing purposes. We now know that Vigée Le Brun’s œuvre in pastel was far more extensive than previously thought; as the Paris leg of the exhibition suggested (and as you can see in more detail in the article in the online Dictionary of pastellists), she used the medium in two quite separate ways. In addition to the traditional pastel portrait her father had practised, resulting in a ‘peinture au pastel’ delivered to commission, she used pastel as a medium to develop her ideas – including several hundred small landscape sketches, as well as smaller portraits on loose sheets that had not previously been ‘marouflé sur toile‘ (pasted onto canvas) as the first step her father’s craft required. These sheets were not framed immediately (and were probably not intended to be framed at all), and so in many cases the frames we have, however magnificently selected by later dealers and collectors, do not inform us about her art. 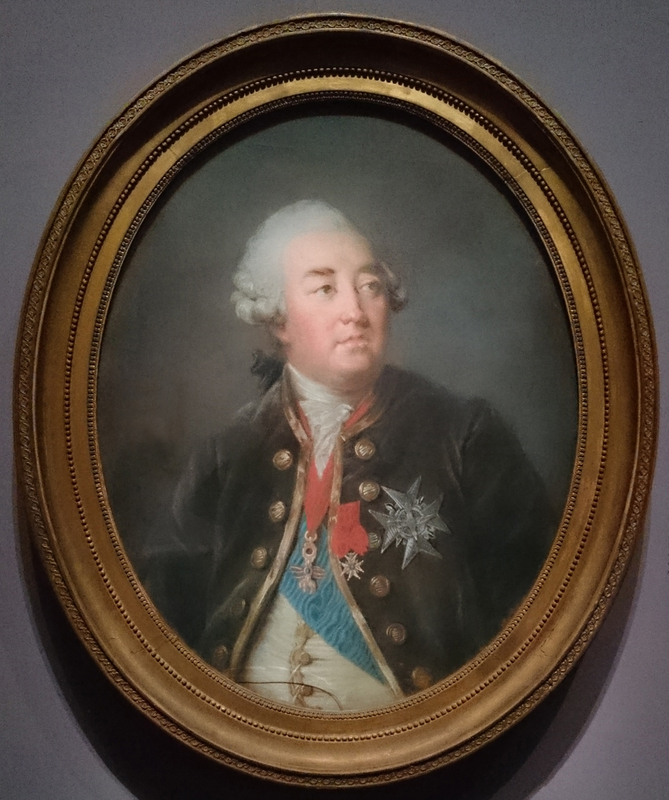 By the time Vigée Le Brun was active, a Louis XVI NeoClassical sobriety had set in. As early as 1753 critics such as the abbé Le Brun had attacked the vulgarity of ostentatious frames which dominated their contents: a ‘contraste ridicule‘ resulted from this reluctance to pay more for the picture than for the ‘cartouche bizarre qui lui sert de bordure‘ . Good taste required that such risks be avoided at all costs. The first group of her frames certainly conform to that: they appear from 1773, when she was still only 19 but had established an independent practice. Few of these pastels were represented in the Paris exhibition, and none with the straightforward oval frame that characterises the group: a flat giltwood architrave frame, with simple beading inside the top edge, or outer rim, and rais-de-coeur sight edge. They were very common at the time, and examples may be found on the work of many contemporary pastellists including Rosalie Filleul and Pierre-Adolphe Hall. 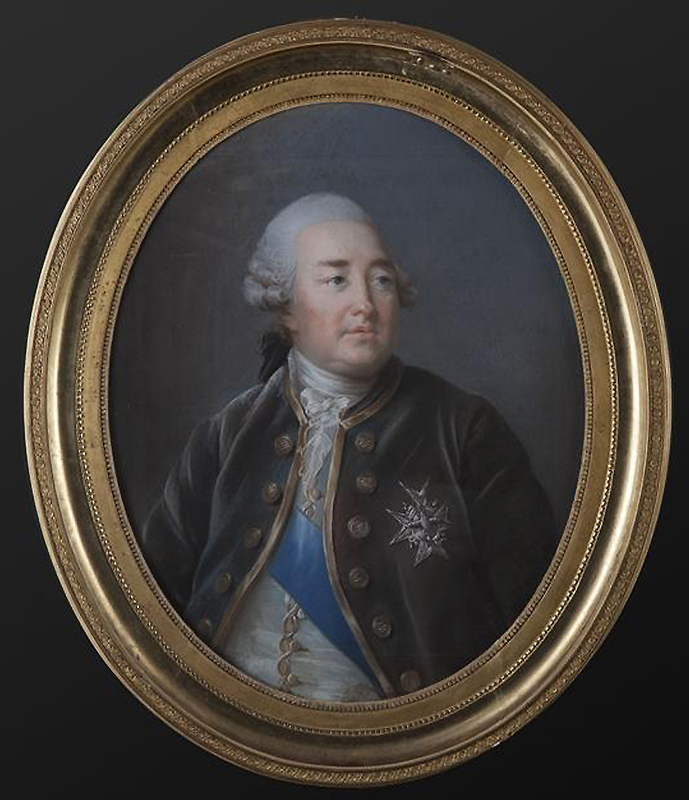 Although her father had died six years before, some of these early pastels still show his influence, as on the Enfant au bilboquet  of 1773. 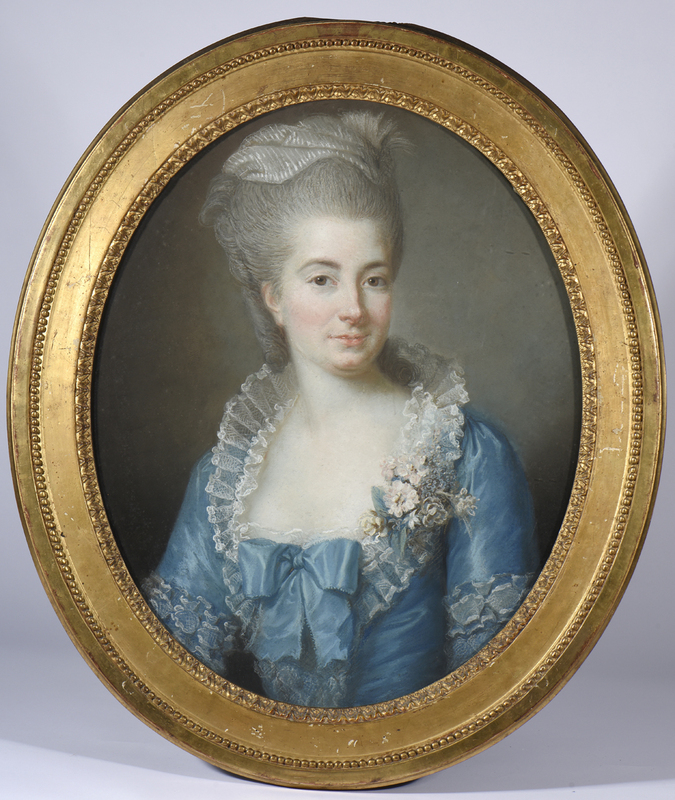 From the following year, a lady in a blue dress (strikingly similar in pose to an oil of her mother, although whether the pastel too represents her is disputed) has an identical frame. Several other examples show that it was still in use as late as 1777 (comtesse d’Hunolstein). A consciousness of the absolute necessity of refined restraint was particularly evident after Vigée Le Brun’s 1776 marriage to Jean-Baptiste-Pierre Le Brun, who (whatever impression we may get of him from the Souvenirs, and however misleading they may be) was perhaps the most astute picture dealer of his day, with an eye that combined connoisseurship with the deepest possible understanding of the tastes, prejudices and concerns of his clientele. We can assume that he was instrumental in her selection of framers after their marriage, and that an understanding of her framing policy – if the documents were found to explain it – would add greatly to our information about the artistic milieu at the end of the ancient regime. During 1776 she made (her first contact with the royal family) a series of portraits of the comte de Provence: her work list indicates ‘12 Monsieur, frère du roi‘, while the payment order, signed by the prince 21 November 1776, merely indicates 2320 livres ‘paiement tant de notre portrait en original que de plusieurs copies qu’elle a faites.‘ The difficulty is that these have not survived , it is difficult to reconcile the invoice with the worklist (which I suspect conflates the handful of repetitions covered by the recorded payment with the pendant and further repetitions made after the payment), and we don’t know if the primary versions were in oil or pastel (the latter quite likely, as suggested by other examples below). Again there is no mention of framer. But also in 1776 we see a development in the choice of frame, as exemplified by the beautiful oval for Mme Sanlot (1776; not exhibited): here the basic flat architrave moulding is unchanged, but it is surmounted by an elaborate ribbon bow which could almost stand as a metaphor for the elaborate high-piled hairstyles that had begun to elevate themselves at this stage. The burnishing is also developed to a high level (although it isn’t always easy to tell whether this is original: frames have condition and conservation issues as complex as the pictures they enfold). A second essay in a slightly different direction was presented by the Jeune fille en rosière (or at least en jardinière) of 1777 (not exhibited): here the bow is further elaborated, in scale and by the addition of foliage (echoing the picture, and reinforcing the idea that this is the cadre d’origine), but the main change is to extend the outer rim by introducing a fluted hollow section to push the beading into the centre of the moulding. Nothing uncommon here: the fluted hollow was much favoured for example by Étienne-Louis Infroit, but widely used by others. For my taste however balancing the proportions of the fluted and flat sections becomes difficult. But it is soon after that the first example arises of a style that was to become her favourite for a decade. 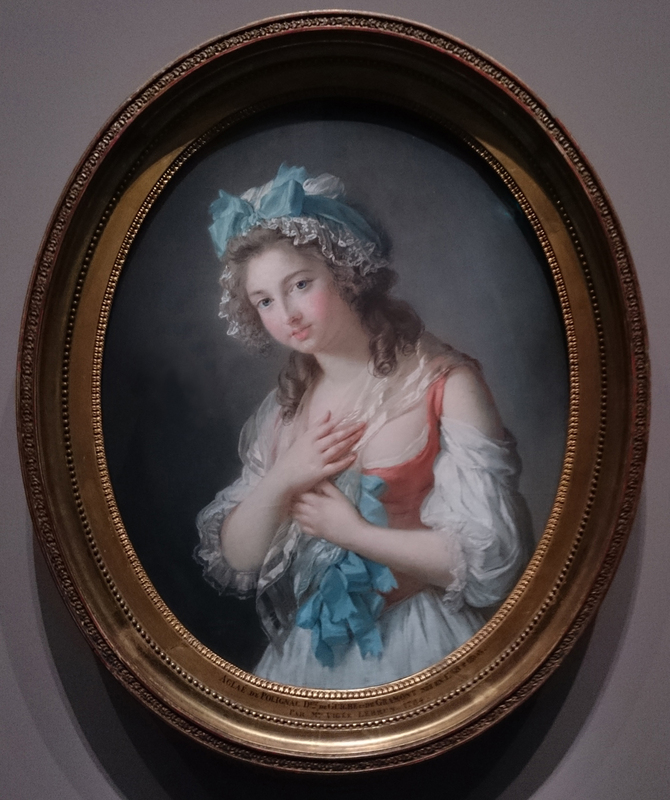 Transcribed by the auctioneers as 1777, the last digit after the signature on this Jeune femme en Diane (not exhibited) is hidden by the sight edge, and could perhaps be ‘8’. The frame itself is a masterpiece of Louis XVI design, looking forward to the NeoClassical without uprooting the Rococo influence. The idea is simple: take the previous example, but replace the fluted section with a plain hollow. Leave the beaded central run where it is, and the short flat and rais-de-cœur sight edge. Transfer the decorative element to strengthening the top edge, by filling it with a moulded (composition) string of alternating piastres and rosettes. 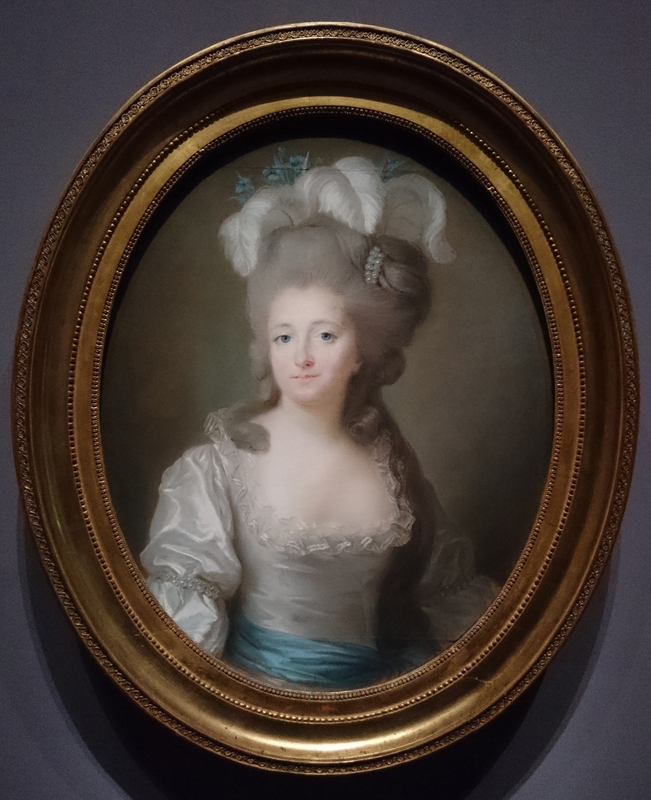 One of the most beautiful examples is that on the duchesse de Guiche (1784), shown both in Paris and New York. But the tension set by the weight of each of these elements invites variations, as exemplifed by the dozen or more that have survived: the various examples show subtle differences in the width of each section. 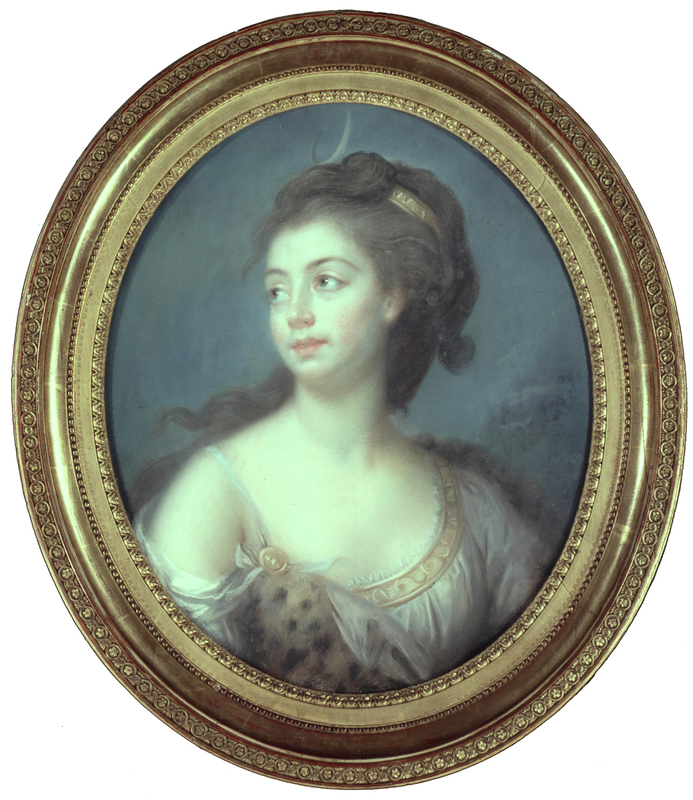 (Among them the prince de Montbarrey, above; Mme de Saint-Huberty, Louveciennes, 1780; the duc de Brissac, private collection, 1783; none exhibited; and the marquise de Lastic, 1779, shown in Paris: below). The strings of piastres and rosettes can have different repeats. The beaded middle row can be replaced by a double bead and husk motif, as in Beaujon, above (not exhibited). And the degree of burnishing can be extremely varied – both between different examples, and even across different sections. Some of the frames have lettering on the frieze (mostly it seems added later), or on decorative frontons (Mme de Montesquiou, 1780). 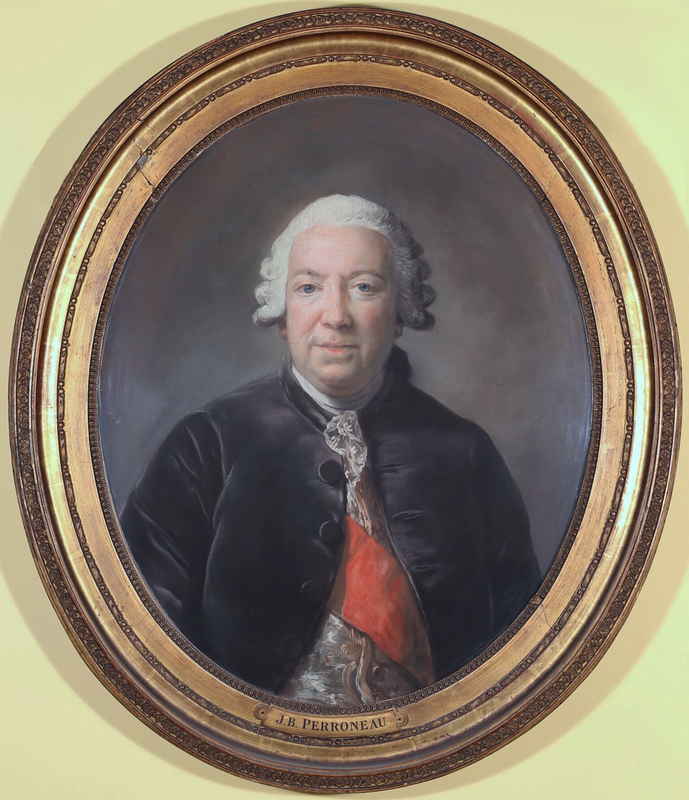 One  even has a label identifying the artist as Perronneau, an error made by the Goncourt brothers: their immense contribution to the revival of interest in the dix-huitième was not matched by an understanding of Vigée Le Brun’s art. Of course this moulding was not unique to Vigée Le Brun’s pastels. Joseph Boze used a similar style, which we know was supplied by the peintre–doreur Louis-Quentin Joly, and no doubt other framers turned out similar things. We don’t (as I noted earlier) have that information for any of these Vigée Le Brun frames, but a fascinating document was discovered recently by Geneviève Haroche-Bouzinac that relates to the pastels of the duc d’Orléans (two versions) and his morganatic wife, Mme de Montesson, which were show together for the first time in the Paris leg of the exhibition. Only one of these pastels was known until recently (although they are mentioned, with unspecified medium, in the artist’s work lists), but I spotted the pendants being offered anonymously in a sale and was able to draw the auctioneers’ attention to the signatures; they were subsequently acquired by the Louvre. What the invoice shows is that the artist made five pictures in all, using either pastel or oil. The primary versions cost 480 livres each, the repetitions 360 livres; the frames with glass, 84 livres each, without 78; since the most highly decorated frames had glass, the inference is that the primary versions (still it seems lost) were in pastel. So, while we don’t get the framer’s name, we do learn several things beyond the price of glass. We see that far from being a cheaper option, pastels could cost as much as oils. 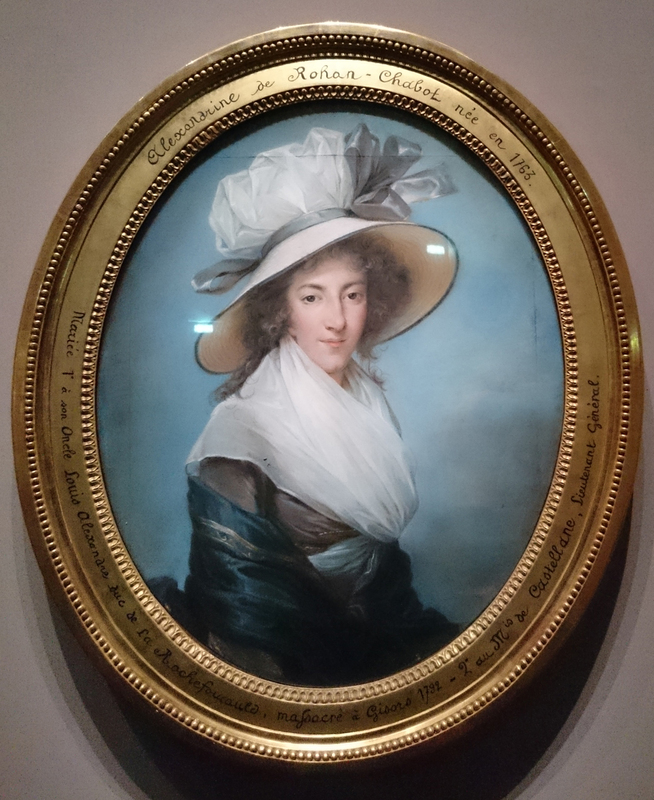 And that Vigée Le Brun’s practice (as with other examples) was to work from life in pastel. 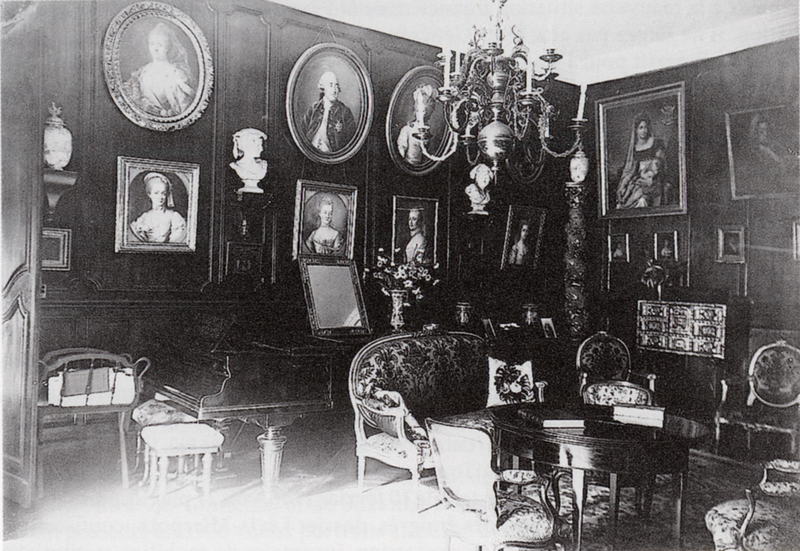 The provenance of the Orléans/Montesson couple was uncertain; but this I was able to resolve with the aid of a photograph showing the pictures in situ at the château de Léran early in the twentieth century. Initially the Louvre thought these must be different versions, as the photography seemed to change the ratios of the width: but genealogy combined with a tiny scorch mark on the top of the duc’s frame (evident from my original photograph before the museum attended to the damage), just visible in the Léran photograph, to remove any doubt. 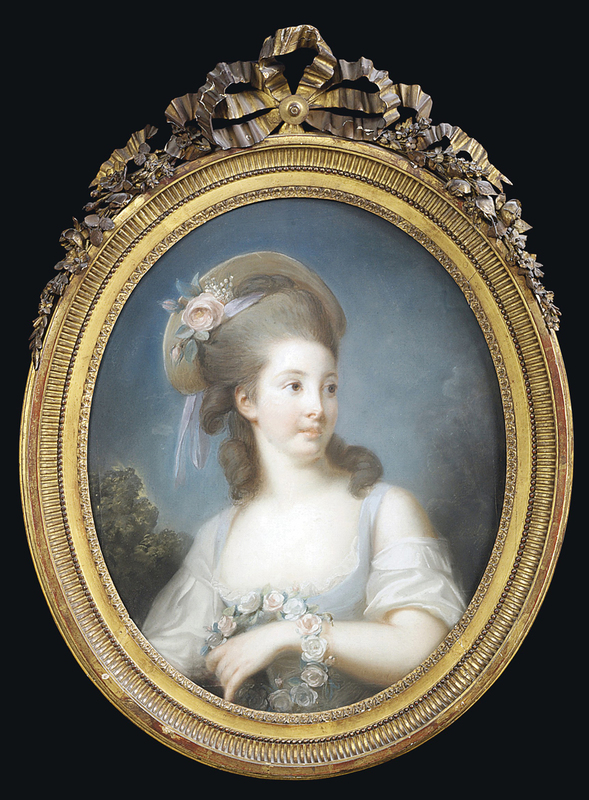 Most of these oval frames are of similar size, but Mme Chalgrin (1789, one of the last in the group) is distinctly smaller. With Alexandrine de Castellane (also 1789), the series comes to an end: the running composition decorating the top rail reverts to a plain flat section, and apart from a fairly shallow hollow, one is virtually back to the classic architrave which she used at the start of her career. Thus we have reached the Revolution, and the end of an extraordinary period of framemaking. Vigée Le Brun emigrated, and if her productions abroad are in Parisian frames, they are not cadres d’origine. Neil Jeffares is an art historian with a particular interest in 18th century pastels. Since 1999 his contributions on art history and portraiture have appeared in journals ranging from the Burlington Magazine, Apollo and the Gazette des Beaux-Arts to the British Art Journal, the Court Historian and Le Musée Condé. In 2006 he published the Dictionary of pastellists before 1800; it was awarded the Besterman/McColvin medal for the outstanding reference book published in the UK that year. Since then he maintains a greatly expanded online version of his work on the website Pastels & pastellists. He is committed to sharing this information as widely as possible, without profit, and most of his research is available freely to all. See also Neil Jeffare’s essay, ‘Antoine Levert, maître menuisier-ébéniste‘, as a possible maker for the penultimate run of frames, above. Note that the Paris leg of the exhibition included 32 pastels, while the American leg included only five. 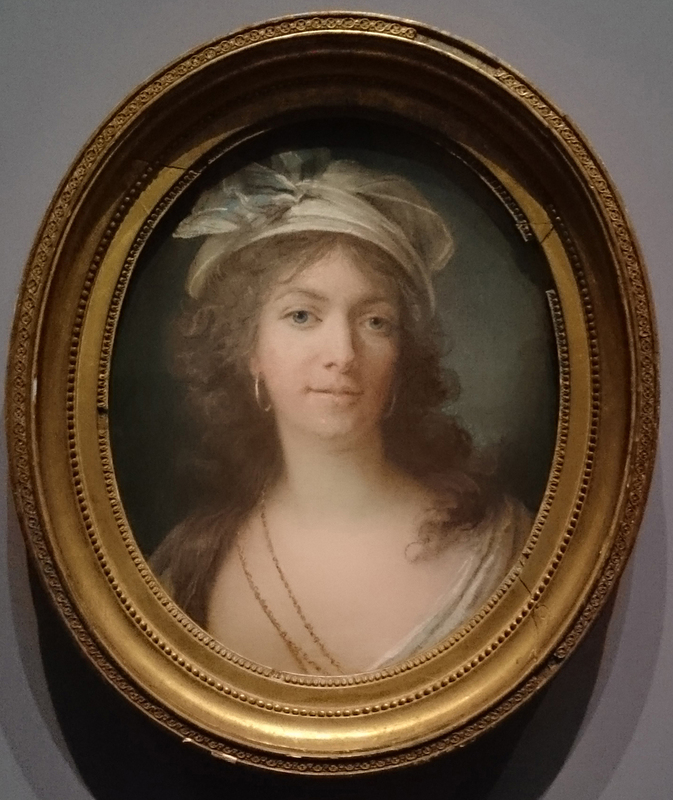 I am grateful to Joseph Baillio (the leading light behind the exhibition) and Geneviève Haroche-Bouzinac, experts on different aspects of Vigée Le Brun’s life and work; and of course to The Frame Blog. There is a section on pastel frames on pp. 29ff of the Prolegomena to Pastels & pastellists, with a more detailed discussion and references. 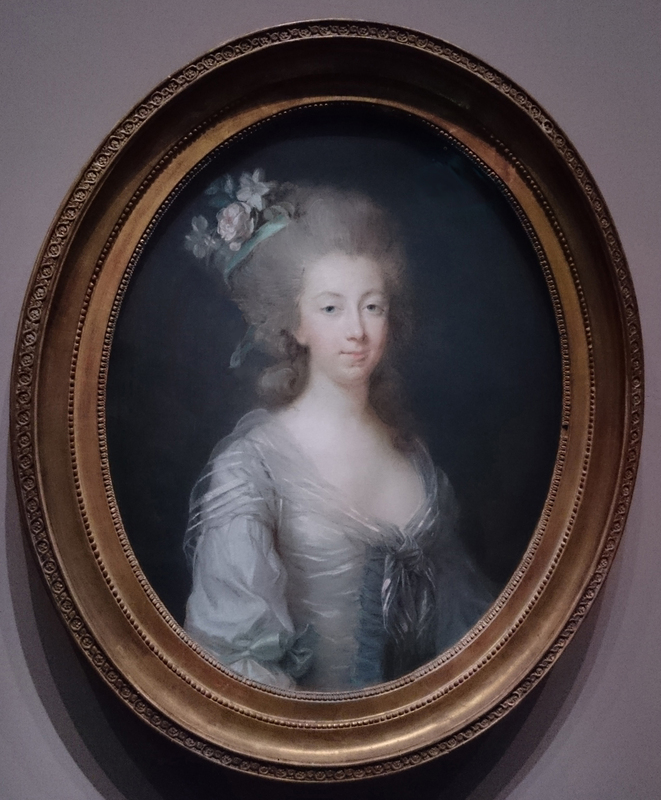 We know for example that Vigée Le Brun used the framemaker Buteux: a copy of her portrait of Marie-Antoinette supplied in October 1784 was ‘remis par ordre de la reine à M. le comte d’Adhémar, Ambassadeur du Roi à la Cour de Londres‘ for 2800 livres, including 400 for the frame by François-Charles Buteux (Christian Baulez, Burlington Magazine, June 2009, p 377): Buteux supplied frames for the numerous répliques of the Callet portrait of Louis XVI at 1800 livres each. 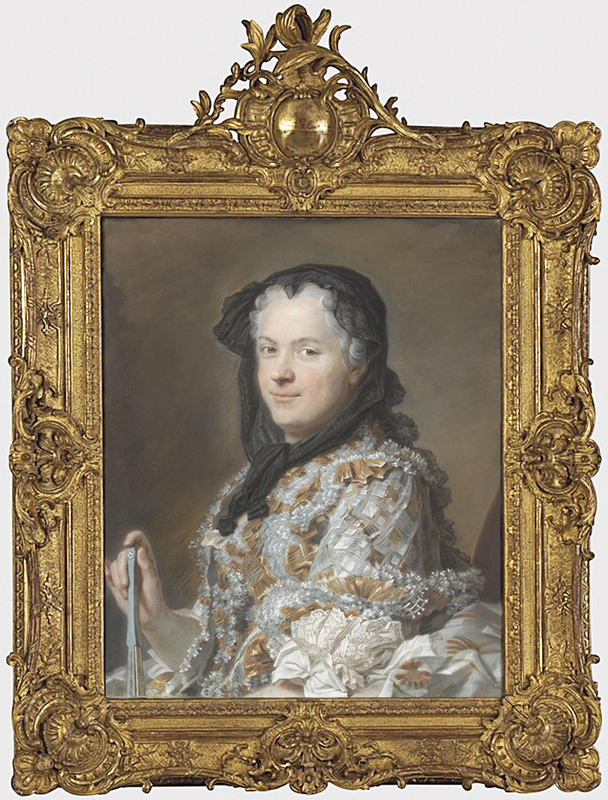 Baillio (L’Œil, March 1981) traces the 1787 portrait of the queen (Versailles, inv. MV 4520), executed for the Bâtiments du roi and exhibited in the salon de 1787, no 97; transported by Buteux to Versailles November 1787, for which the invoice exists. An even more complicated story surrounds the magnificent frame designed by Jean-François-Antoine Boulanger, finished by François Duret and invoiced to Versailles in 1773. There it was exhibited empty for a couple of weeks in 1775, but reviewed in the Mercure; the painting for which it was intended was not immediately ready. Despite several discussions in the literature (notably by Bruno Pons, in ‘Un collaborateur de Chalgrin. François-Joseph Duret [1729-1816], sculpteur figuriste et sculpteur ornemaniste. Son livre-journal de 1767 à 1806’, Bulletin de la Société de l’histoire de l’art français, 1985, pp. 137–178, where the frame is reproduced, and Revue de l’art, 1987), that painting has not been identified (Gautier Dagoty’s portrait of the dauphine would fit logically, in that it was so disliked, chronologically, but not physically) but was evidently rejected; and the frame now houses a repetition (Versailles, inv. MV 3892) of Vigée Le Brun’s 1787 portrait of Marie-Antoinette of which the original is in Vienna. Anon. [abbé Jean-Bernard Le Blanc], Observations sur les ouvrages de MM. de l’Académie de peinture et de sculpture, exposés au Salon du Louvre en l’année 1753 et sur quelques écrits qui ont rapport à la peinture, à M. le président de B***, s.l., 1753, p. 155f. The passage is discussed in Pons’s 1987 article cited above, p. 43 and n.18. The profusion of infants and animals on the Boulanger/Duret frame comes to mind, even if it was not have been Le Blanc’s specific target. Most of the works described are in private collections. For full provenance and other details, see the Dictionary under the relevant sitter’s name. Photographs have been used from various sources as recorded in those entries; it has not been possible to trace copyright holders or owners in each case. Except one oil repetition. A pendant of the comtesse must have been made, for they are evidenced only by two mezzotints published in London by William Pether in 1778 (two chalk drawings in Windsor relate to these, but are date 1777, after the invoice. Beaujon: see the discussion in my essay. Fascinating essay-many thanks for your scholarship and commitment to sharing the fruits of your labor. I have passed your comment on to Neil – thank you!